“The thing I thought could be new, that I thought I could add new to the story, was about a man who begins to divide himself in the same way as a country divides itself… I like the idea of mutinous body parts, of a body coming apart at the seams." 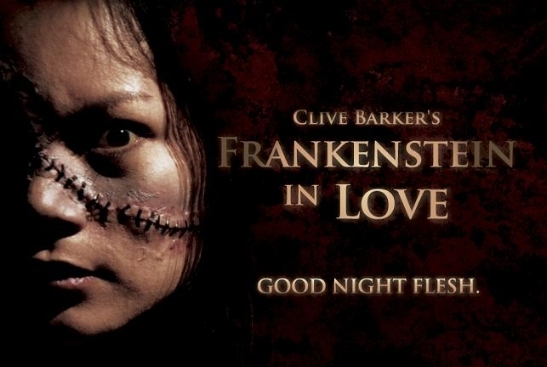 An early play by Clive Barker, Frankenstein in Love, or The Life of Death, is a wild mix of political allegory and weird romance set in a fictional Latin American country. Dr. Frankenstein is a state-supported torturer experimenting on the downtrodden citizens, and his Monster, El Loco The Bogeyman, is a rebel leader. A doomed love triangle is established when both men fall in love with the ever-morphing Veronique, Frankenstein’s ultimate creation. 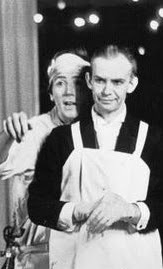 The play was first staged in 1982 by The Dog Company, a London fringe theater group co-founded by actor Doug Bradley (pictured here playing Dr. Frankenstein, with John Elnaugh). Barker and Bradley, fellow Liverpudlians, would reunite in 1986, when Bradley was cast as the horror icon, Pinhead, the Head Cenobite in Barker’s film Hellraiser (1987). 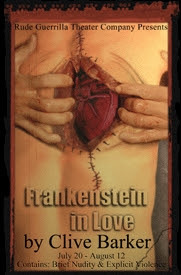 Experimental, horrific and perverse, Frankenstein in Love was done in the Grand Guignol style of staged graphic horror. In a 1986 Fangoria interview, Barker said, “The 'Grand Guignol' tradition fascinates me. The idea that there was this theatre in Paris where you went just to watch people mutilated and dismembered onstage strikes me as fun. I thought I'd try my hand at a piece of shock theatre.” A highlight of the play comes halfway through the proceedings when Frankenstein flays El Loco alive, hanging the gory, gruesome, empty skin like a flag on the rafters. Reviews of the play often criticize its length and talkiness, but its jet-black humor, its provocative tone and, no doubt, Barker’s now famous name, has seen the play through several revivals. Barker’s generosity is also a factor: When he first released collections of his plays in book form (Frankenstein in Love appears in Incarnations), he offered the rights for just $1 and invited theater companies, amateur or professional, to mount his plays, just to get them seen. The image at top is from a 2006 version directed by Gavin Yap in Kuala Lumpur. The graphic at left is from a 2002 version by Sensurround Stagings in Atlanta, Georgia. The poster at right is from the 2001 version by the Rude Guerilla Theater Company of Santa Ana, California. Read about a 1996 version directed by Russell Blackwood for San Francisco’s Thrillpeddlers here and here, with production photos here. Read a review of a 2004 version produced at the Vortex Theater in Albuquerque. The Clive Baker Resource site is here, and the play Frankenstein in Love is discussed here and here. A bibliography of the Incarnations collection is here. And here’s a short BBC profile of Clive Barker, Barker's Wiki page, and an elaborate fan site. When I was told of an adaptation of Frankenstein by Clive Barker ( not a, but the ) over a beer the other night I scoffed.